Spillages are a major cause of slips and falls in the workplace and must be rapidly identified and removed in accordance with government health and safety legislation. When the staff has the tools to clean spillages promptly, downtime can be reduced and the risk of accidents and injuries can be kept to the minimum possible level. Having spill kits conveniently located in high risk areas gives workers the tools they need to contain spillages quickly, reducing wastage and improving clean up time. If you are interested in reducing your reliance on single-use plastics, you could check out our range of low carbon footprint recycled absorbents. 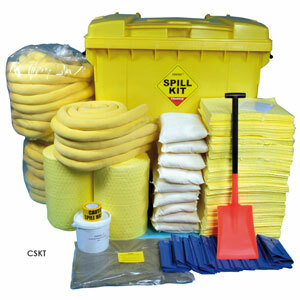 A basic general purpose spill kit must contain at least three components. In accordance with Health and Safety Executive regulations, personal protective equipment (PPE) must be supplied to enable employees to mop up spillage safely. The extent of the PPE must be suitable for the spillages likely to be encountered. Small spill kits should contain safety gloves, while larger kits for dealing with spillages of solvents, oils and chemicals should include more extensive PPE equipment such as overalls and safety goggles. Containment of a fuel or oil spillage is vital to minimise the risk of accidental injury. Spill kits for locations where oil or fuel are stored should include absorbent socks to contain the spillage, drain and gully covers and absorbent granules. Mobile granule dispensers ensure larger spillages can be cleaned promptly and are a wise investment if frequent spillages are to be expected or if dangerous or potentially hazardous liquids are stored in bulk on site. It pays to plan for the worst case scenario and to stock spill kits for dealing with the full range of chemicals likely to be encountered in the workplace. The spillage risk should be assessed and appropriate treatment kits should be available to employees to ensure caustic liquids, oils, fuel, solvents and other chemicals can be cleaned safely. Personal protective clothing must provide the appropriate degree of protection and the spill kit should include nitrile gloves, goggles and overalls, in addition to instructions on procedures to follow. Spill kits should be monitored and restocked as items are used. It is possible to buy individual materials to restock a spill kit, with the commonly used items such absorbent pads and granules usually available at a discount when purchased in bulk. When replenishing a spill kit it is important that the items are repacked in the order in which they will be required. Uppermost must be personal protective equipment, followed by absorbent materials with waste disposal bags on the bottom. We stock a comprehensive range of spill kits for use on water, solvents, oil and chemicals, with a selection of equipment to ensure rapid containment of spillages and fast clean up times. We stock heavy duty products for dealing with major industrial spillages, including mobile spill kits and granule dispensers for spreading absorbents quickly and products to assist salvage and waste prevention. Smaller spillage kits suitable for use in garages, warehouses and workshops are also stocked together with emergency spill kits specifically designed for use with trucks, tankers and fork-lifts.